The walker's Golden Labrador runs forward to check what that man is doing standing on a stepladder in a field near Battledown Flyover, whilst Class 412/1 4-CEP 2315 & Class 411 4-CEP 1539 pass by with the 08:55 Bournemouth to Waterloo South West Trains service. The date is 30 March 2003, and the vintage 4-CEPs, which of course were not originally to be seen in this area, had only a short while left in traffic, before being replaced by more modern units. 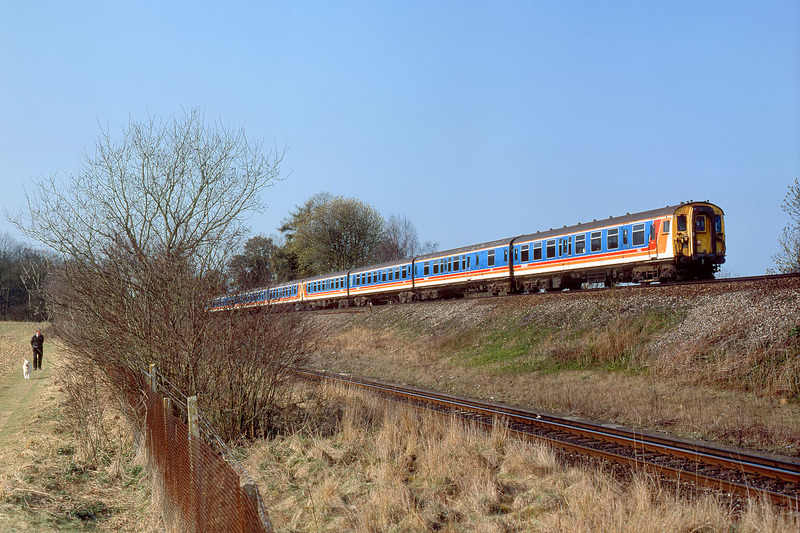 2315 was originally a 4-BEP unit (2305), but in 2002 its buffet car was replaced with a conventional trailer vehicle. This unit is one of the few to have escaped the cutter's torch, and is currently at the unlikely location of the Eden Valley Railway, in Cumbria.